Examples that demonstrate basic Java functionality and the essential Java API's, including I/O, threads, networking, security, reflection, serialization, and security. Programs that use the graphical user interface and graphics features of Java, highlighting the Swing, Java 2D, printing, data transfer, JavaBeans, and applet APIs. Examples that illustrate key enterprise APIs in Java, including remote method invocation (RMI), database connectivity (JDBC), servlets, JavaServer Pages (JSP), and XML. 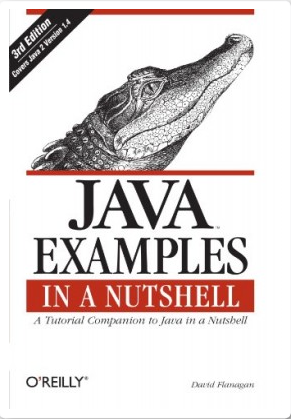 An example index that lets users look up a programming concept or Java class and find any examples in the book that demonstrate that concept or use that class. Click here to see online. Download the book's Russian translation here.